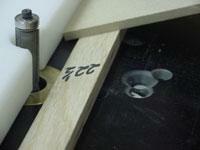 The table mounted router can be used for a variety of operations. Today we will take the table mounted jointer fence, add a few parts and turn it into a bevel fence for your router! 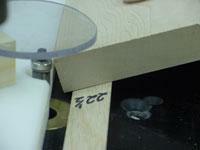 We have chosen a 22 1/2 degree fence to bevel the edges of an eight sided tapered basket. 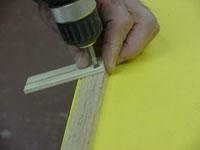 This fence can be used to make 30 or 45 degree bevels by simply changing the hardwood strip. The materials required to make this bevel fence are a regular jointer fence, two small machine screws with wing nuts, two pieces of 1/4” slotted plywood and one piece of beveled hardwood 19” long. 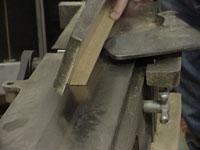 Use a jointer to put a 22 ½ degree bevel on a strip of hardwood. 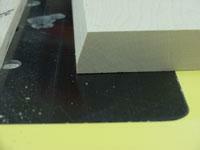 Cut the beveled edge on the table saw. Screw the slotted plywood pieces to the beveled hardwood strip. 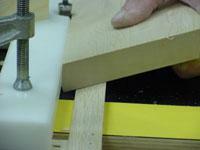 Drill and mount the two machine screws on the bottom side of the jointer fence. The slot allows the beveled strip to move in and out when it needs adjusting. 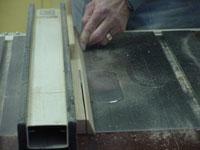 Flush the outfeed edge with the bit and clamp to the router table. 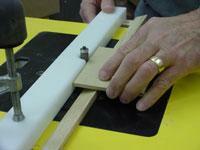 Use a thin piece of wood to locate the beveled hardwood, then tighten the wing nuts. 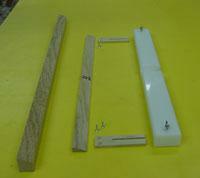 It will take 3 or 4 passes to bevel the material (depending on the thickness). We left a square shoulder on our pieces to give our column more detail.